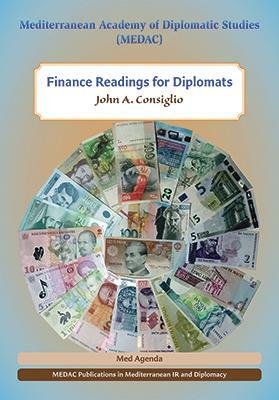 John A Consiglio: Finance Readings for Diplomats. MEDAC Publications in Mediterranean IR and Diplomacy, 2018. John Consiglio is an ardent reader and a prolific writer. He is also a friend, I dare say my mentor, an inspiring person who has always instilled high standards of academic excellence in me and, doubtless, any student or researcher who sought his assistance over a span of over 60 years of a distinguished banking and academic career. The University of Malta’s Mediterranean Academy of Diplomatic Studies (MEDAC)’s publication – Finance Readings for Diplomats – is a fitting tribute to Consiglio’s academic contribution at the Academy and at the Faculty of Economics, Management and Accountancy on banking subjects and economic thinking. In this publication, MEDAC has brought together five of the author’s many papers analysing financial services and economic thinking from different perspectives: from the challenging transition of post-Cold War banking sector in some countries which had formed the Eastern Block, to the application and teaching of regulation, and finally also an analysis of geo-economic tensions in the Med area. His study on the challenges of teaching financial regulation reflects Consiglio’s yearning for “an effective mix of hierarchy and specialisation to tackle several constantly reappearing new technical regulation problems”. Financial regulation has evolved tremendously, as anyone who has been in the industry for This publication is recommended high-quality reading so many years knows only too well. But even the thinking about regulation has also developed. In his essay, Consiglio refers to many facets of the teaching of financial regulation and the challenges for academics when constructing their course work. If banking was the epitome of so many things, both financial and social, its lustre has often been overshadowed not only by exponential growth in the fund industry but also by many scandals which led to erosion of trust and which cost the industry a whopping £264bn in conduct costs for the world’s leading 20 banks between 2012 and 2016 (CCP Research Foundation, 2017). Over the years, learning and studying about financial regulation, its evolution at European level and the influence of supra-national international standards on national regulatory rigour was – and continues to be – a compelling task. Endlessly important is the pursuit of public interest which, as Consiglio contends in another well-articulated essay on the nexus of better regulation and governance, is best described as that which upholds “the greater interests and benefits of the majority of a population”; indeed this best describes my own 20+ years career as an MFSA official. Consiglio must have probably noticed that the discipline of regulation, in itself, may no longer be as compelling/engaging for some students as it was many years ago. Not because the subject has lost its relevance but rather, I dare say, regulation has become associated with a tangled web of overly prescriptive and dauntingly complex rules, of which some risk unforeseen outcomes. That may be a fatalistic assumption, true, but nonetheless worrying if the discussion and research about the application, reform and failures of regulation are dislodged from the wider context of the purpose that it ought to serve: the public interest. Plus, of course, that it is becoming clearly evident that areas which require students to read-think-read-think-and-read-again are easily losing out to others which ask for less hard work. Yes, it is a fact, far too many students are opting for soft-work options today. On reflection, what is the scope of learning and understanding the effects of regulation if that effort remains confined, or hidden from stakeholders such as policymakers, regulators, industry and consumer groups? Researching financial regulation, in all its forms and facets, takes great effort and sacrifice. Occasionally, dedicated researchers such as Consiglio produce good quality material for discussion and reflection. But has this outstanding material contributed to a broader learning perspective beyond academic circles? I dare say that, at times, academic thinking and research have struggled to find their niche in the local financial services sector. Not to mention critical assessments, which quite often remain merely hushed small talk during networking opportunities. In The two sides of the Mediterranean, the fifth and most thought-provoking essay in this small collection, Consiglio bares his impatience and frustration that, in spite of the potential of the MENA region, conflict stifles the economic well-being and rips apart the social fabric of such a culturally rich region. Consiglio observes that the EU citizenry have tired out waiting for a Europe that is tougher on the problems stemming from MENA, issues which that region is unable to sort out for itself, and often continues to shift onto the southern parts of Europe, leaving our continent confused as to what are the desired actions it should take. The author claims that there are too many biases that inherently and explicitly keep coming in the way of necessary policy changes that could bring about real change in the region. The first two chapters of this publication make for interesting reading as they give an insight of the challenges experienced by Romania, Estonia and Slovakia in the late 1990s and beginning of the millennium in the transformation of a closed banking sector to an open one. Analysing the trials and tribulations of these countries’ experiences, and the banking challenges they are experiencing today, provides rich ground for reflection on the values of prudence and behaviour which, in Consiglio’s experienced view, should underpin the trust that every bank must enjoy. Certainly, this publication is recommended high-quality reading for whoever has at heart thought-provoking opinions, drawn from years of industry experience and academic excellence. Consiglio’s collection has enriched Melitensia with yet another outstanding publication. This is a must-read, especially for the many students who have benefitted from this researcher’s boundless enthusiasm and erudite thinking. Geoffrey Bezzina is Chairman of the Board of Management and Administration of the Office of the Arbiter for Financial Services.